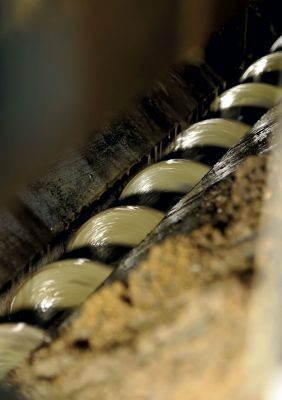 The artisan manufacturing process used by the Emile Noël oil mill is traditional and age-old, using old screw presses, carefully maintained, to extract the oil slowly and gently. It takes from 2 to 14 kilos of raw material to produce one lire of oil, depending on the type of seed used. At Emile Noël, everything possible is done to preserve the nutritional and organoleptic qualities of the raw material. 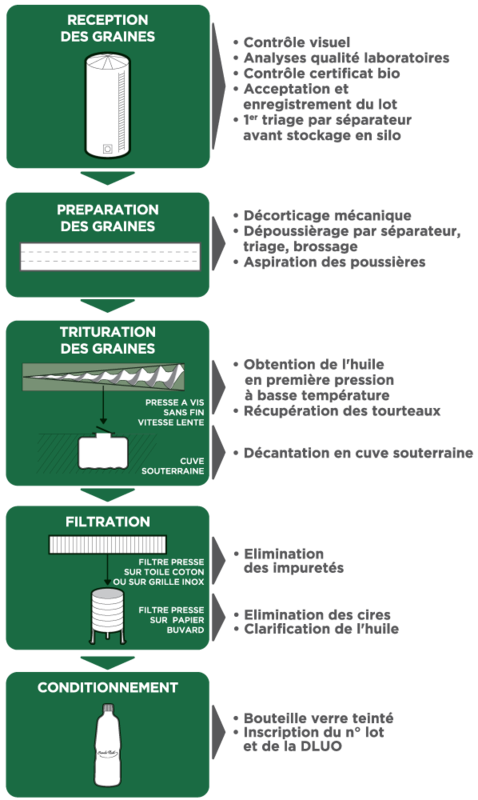 As shown in the diagram below, Emile Noël organic virgin oils are manufactured by mechanical processes, using first cold pressing or cold extraction, without any chemical treatment. The presses we use date back to the mill’s beginnings in 1960. These are in excellent condition and work perfectly. Our presses operate using a worm gear mechanism, so they rotate very slowly at a temperature below 60°C. This minimises the heating of the raw materials, which have time to flow slowly. This is perfect for the quality of the product. Manufactured with a conscience and a passion that respects traditional craftsmanship, virgin oils from first cold pressing conserve the full nutritional value of fatty acids and vitamins. Natural and authentic, they deliver the flavour and finesse of the fruit or seed from which they come. In other words, the traditional manufacturing processes that characterise <b>Emile Noël</b> oils make it possible to combine goodness and superb flavour in your food and cooking.